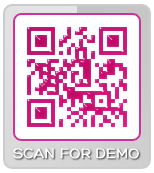 Streaming Radio Stations to enhance QR Code marketing / advertising. Mobile radio station tie-ins create unique advertising. A unique call-to-action, exclusively from PRINT2D, Radio station tie-ins enhance brand positioning while enabling you to deliver a unique experience. Radio tie-ins can be triggered from a 2D barcode or from a link in a mobile landing page. Both options are direct to content. Radio tie-ins provide opportunities for audio advertising. Full analytics are available. Scan the code to listen to internet radio over the mobile Web.